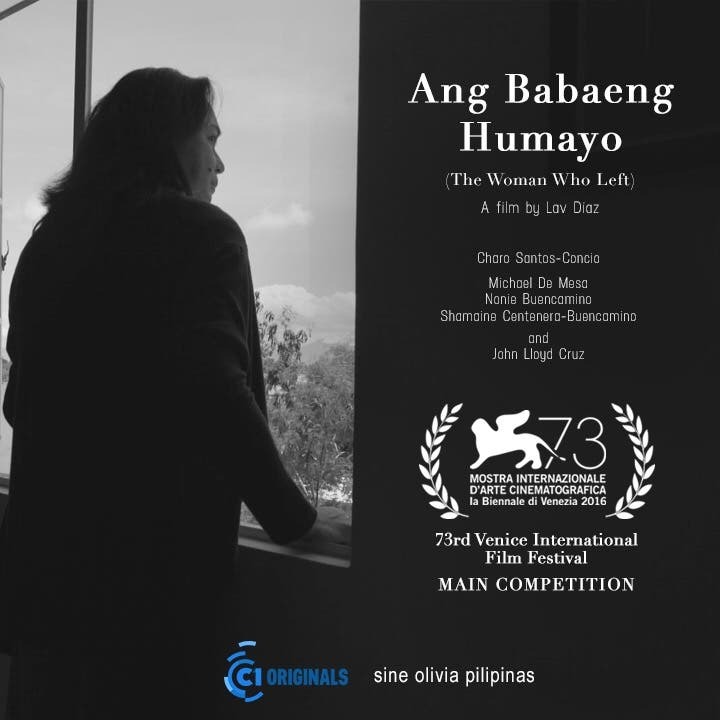 Cinema One Originals and Sine Olivia-produced movie “Ang Babaeng Humayo” (The Woman Who Left), the comeback film of Charo Santos with multi-awarded actor John Lloyd Cruz, is the only Asian film in the Main Competition category to be screened in the 2016 Venice Film Festival this coming August 31 to September 10 in Lido, Venice. “Congratulations to direk Lav Diaz for bringing honor and pride to our country once again. I am very proud and humbled to be part of this extraordinary film and excited for our Kapamilyas to watch it,” said Santos. “Ang Babaeng Humayo” is Cinema One Originals production’s biggest film to date and everyone in the team is excited with the dramatic comeback of Charo Santos,” according to Ronald Arguelles, Cinema One channel head and the film’s executive producer. The movie, directed by internationally acclaimed Filipino independent filmmaker Lav Diaz, was shot almost entirely in Santos’ hometown, Calapan, Mindoro. It revolves around Horacia Somorostro, a woman whose life has become an imprisonment with all its spins and randomness that made it very difficult, vicious, and inexplicable. “The inspiration of the story is Tolstoy’s ‘God Sees the Truth but Waits.’ What really struck me when I read it was that neither of us really understands life. We don’t really know. This is one of the most essential truths of existence. And more often, we abide and succumb to life’s randomness,” shared Diaz, who is also the film’s editor and cinematographer. Joining Santos and Cruz in the movie are Michael de Mesa, Shamaine Centenera-Buencamino, Nonie Buencamino, Marj Lorico, Mayen Estanero, Romelyn Sale, Lao Rodriguez, Jean Judith Javier, Mae Paner, and Kakai Bautista. Cinema One Originals is an annual film festival spearheaded by Cinema One channel. It is now the longest running film festival in the country that produces its own content. Cinema One is the number one movie cable channel in the country. It is owned and operated by Creative Programs, Inc. a subsidiary of the media and entertainment company, ABS-CBN Corporation.